In addition to full-house and whole room decoration jobs, now and then I’ll help a client with smaller jobs — smaller but no less satisfying! Projects such as these may include color plans, E-design plans (where I specify items clients can buy through retail sources according to their own timeline), window treatments, and custom upholstery. Already, she had navigated one of the biggest landmines in DIYing any project — coordinating undertones. 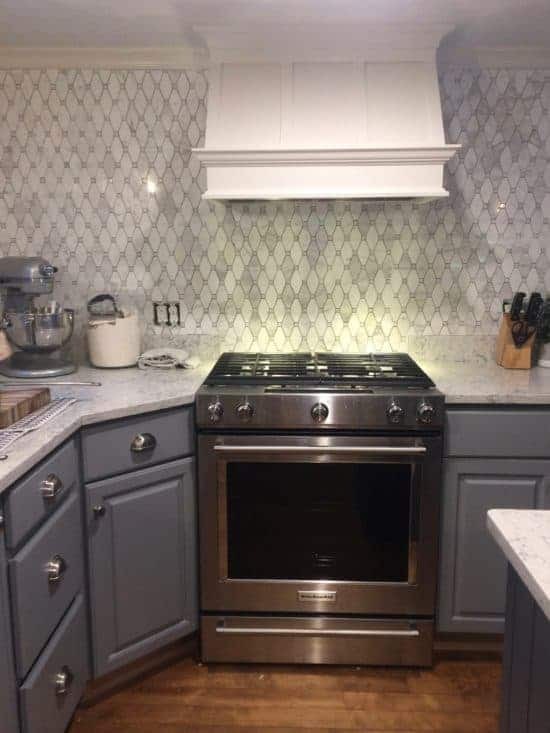 My client had done a bang-up job making sure that the undertones of her gray cabinets, counters, and marble backsplash all complemented each other. Here’s a closeup of the counter pattern — a marble-like quartz. Fabulous, right? So what was her dilemma? She also had some window problems which she had no idea how to address. For example, she needed the option of privacy for the small windows by the sink (above), which overlooked the neighbors’ patio. However, every fabric she put up against the mosaic backsplash looked too busy. Then there was this big window. The kitchen is located in the ell of this antique home, and you can see how low the ceilings are. She had painted this wall a very dark gray above the bead board wainscot and installed some cellular shades to pull down when the weather got cold. She had already selected her counter stools, so she couldn’t add color that way. What to do??????? My client had worked so hard on this kitchen, and she didn’t want to wimp out in the end when she was so close to the kitchen of her dreams. She knew she needed something custom to bring her vision together. I’m so glad she called me. Window treatments in the same room don’t have to be the same necessarily, as long as they relate to one another. Every situation is different — there are no hard and fast rules for when they need to be the same or when they can differ — but there is leeway. My client loved this sage green color found in a couple of of her plants. I thought that we could do a faux Roman shade, aka a Roman valance (Don’t know what that is? Read this post.) 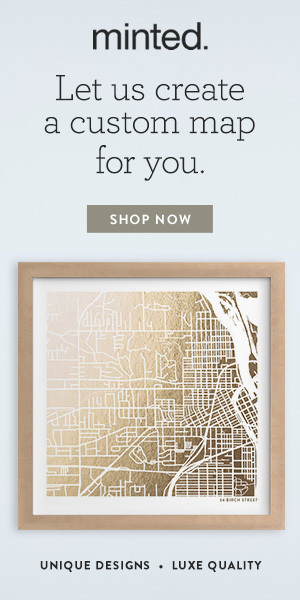 for the big window. We would cover the wall above it and the inside-mount cellular shades, hiding as little of the window itself as possible, and drill it into the ceiling for the most height. One of my favorite trade-only vendors, Horizons Window Fashions, allows designers to choose any COM (customer’s own material) trim on a shade — either fabric banding or flat trim. I thought that, if the fabric my client eventually approved for the big window was too busy a pattern compared to the backsplash for the windows over the sink, we could do a natural shade with coordinated trim to complement the Roman valance on the big window. A natural shade would add warmth and fabric would add color and pattern. She immediately gravitated toward the far left selection. It had her sage-y green/sea foam color she loved, the dark gray of the large window wall, and a clear, big type of pattern she favored. The chartreuse color was an added bonus! 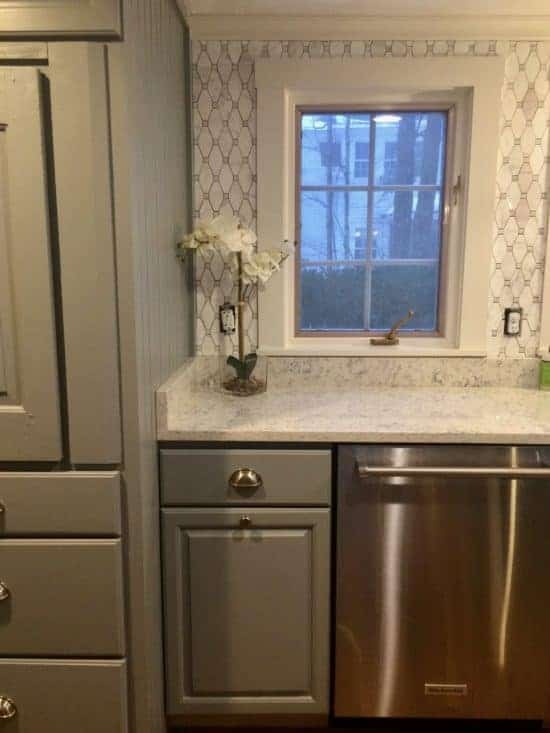 Knowing that it would look too busy when next to her mosaic backsplash, we did choose to go with a natural shade for the windows by the sink and married the two treatments with trim in the same color. As I said, this was a big DIY kitchen. My client felt very secure installing all window treatments herself with her husband’s help (I almost always recommend professional installation, but she was willing to assume the risk). I wasn’t on site, therefore, for the installation — but she was THRILLED with the results!! So much so, that she sent me these pics. The big valance only covers a few inches of actual window. She took a panoramic shot to show both sides of the kitchen. Sometimes a few custom items can help an interior truly shine. I can kill you with aphorisms like “Penny wise, pound foolish,” but Miles Redd probably said it best. Most of us can’t afford to buy the best all the time, but some investments are worth their weight in gold. I hope you like our solution to this design dilemma! ‘Til next week! 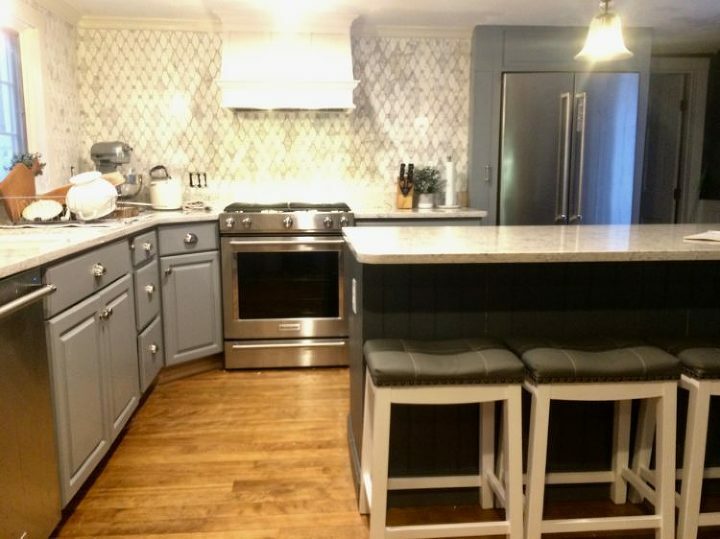 I loved this post–you did a great job completing this kitchen! Horizons is my favorite window coverings company as well–they have a terrific selection and their customer service is fantastic. Thank you, Diana! And Horizons is so well priced for the quality, too.